Home › Physics › anomaly › What to do with OPERA-II event by event neutrino information? By first order I mean exact distance and altitude profile of both satellite and baseline. The exact baseline distance in millimeter accuracy is important since optical path of light at speed of light c is what we compare neutrino distance at speed c, with. As I have mentioned elsewhere, 60 nano-sec is an optical path of ~18 meters. Make that error and the claim of superluminal neutrino automatically vanishes. 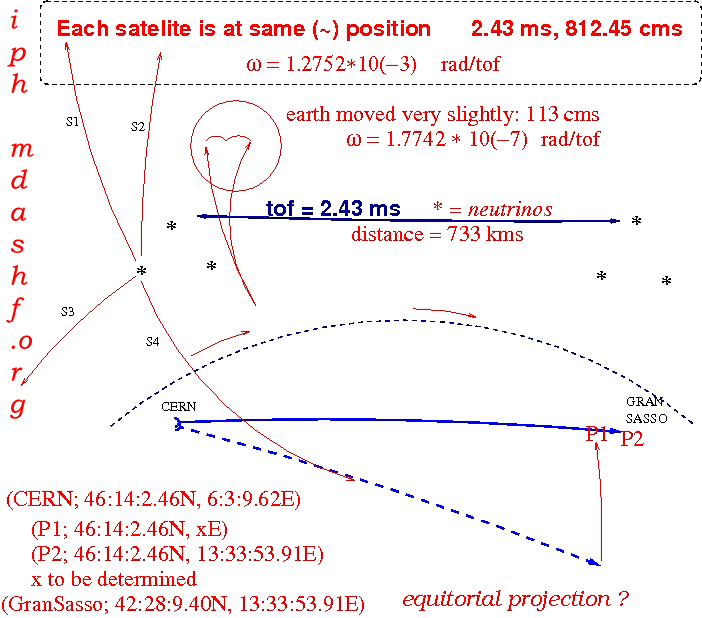 Here is an example which may not fit exactly with CERN – Gran Sasso coordinates, since I took them from Google earth — and in-fact they are valid within a few km as per Haversine distance. But this distance is so because we are trying to project onto a plane and the sines and cosines of longitude and latitude and satellite path should not matter, 8 meters on earth surface in one tof and sine/cosine, latitude, longitude … will still make this within this distance, for complete analysis anyway we need to factor in everything . This is Haversine distance. For millimeter accuracy therefore we need complete coordinate system info, and true latitude longitude etc of CERN and Gran Sasso and projected coordinate-points. We then apply Vincenty’s formula. which is done via numerical methods but we can check our tools for their efficacy. One thing is not getting to some complainers though: by not having details of the path between CERN and Gran Sasso we are only biased against the neutrino and not the photons since two end point latitude-longitude gives the shortest distance or what we can say the optical path. Neutrinos are actually traveling more than this. So with an optical distance if neutrinos show excess over photons, photon speed is violated even for a bias that favors the photons. If this is more than 60 nano-sec then photon is still in problem. So what matters is optical path which is simply the shortest distance between CERN and Gran Sasso coordinates, Vincenty corrections will only make it more precise. But we need not worry about actual neutrino path, which may be longer than optical path. That just means neutrinos had supper along the way and still make it faster than photons. If you want to know more about Haversine and Vincenty’s methods: check here.